The University of West Georgia (UWG) was the first school to have an Honors College in the state of Georgia, according to the Board of Regents of the University System of Georgia. The UWG Honors College helps students excel by offering honors courses, support for undergraduate research and extending many different opportunities for community service. The Honors College also has an Honors Council, which is made up of a group of students who plan and execute activities and projects of interest to the Honors Program. The Council focuses on recruiting new Honors students, making recommendations about the operation of the Honors Program and promoting awareness of service-oriented volunteer events and programs while enriching the Honors program for all Honors students. 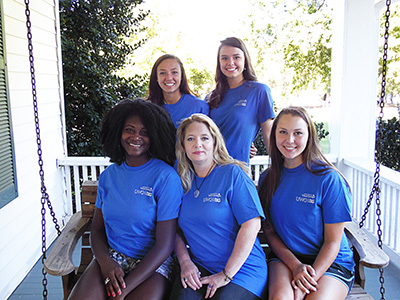 There are five members of the Honors Council: Amelia Bagwell, President; Marshala Cofer, Vice President for Public Relations; Alexandra Sasha Gunter, Vice President for Community Services; Anna Hansen, Secretary; and Christine Perez, Advanced Academy Representative. Stacey Rowland, manager of Undergraduate research for the Honors College, is the faculty advisor for the Honors Council. The Honors Council organizes events for the Honors students. These events are often community service events, but they also organize social events to promote interaction between Honors students. This past month the Honors Council held an Ice Cream Social as a meet-and-greet for all of the Honors College students and faculty. The Honors Council meets once a week to plan events for the following months. Each event takes time and collaboration efforts with other organizations on campus. “As president,” Bagwell said, “my job is made so much easier because of tremendous talent and energy of fellow officers and the direction of Stacey Rowland, our director. My main roll is that of servant-leader, making sure all the correct forms are completed for activities, coming up with ideas and working with the Center for Student Involvement directly.